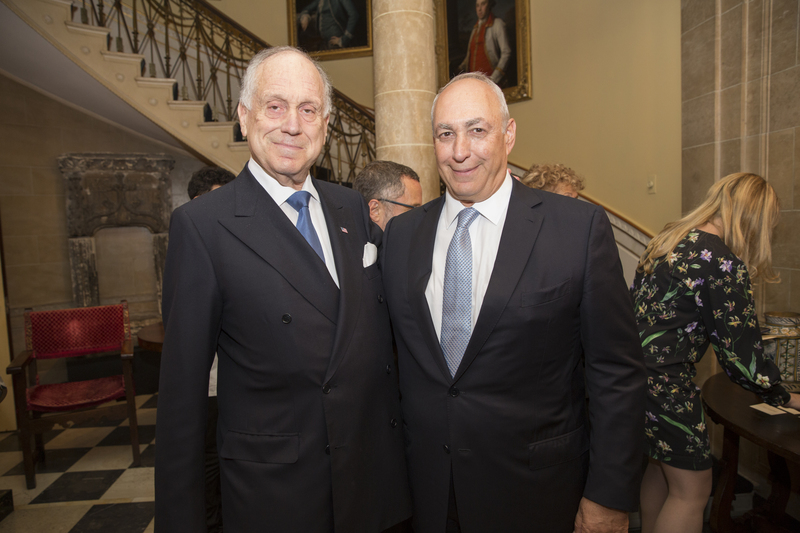 NEW YORK CITY—Ambassador Ronald S. Lauder was honored Thursday night at an intimate celebration hosted by the Peres Center for Peace and Innovation, becoming the sixth recipient of its prestigious Peace and Innovation Award, designed by the late Shimon Peres himself. The event was co-hosted by the UN Women for Peace Association (UNWFPA), an international women’s empowerment group. Chemi Peres, one of the world’s most respected technology venture capitalists, the son of Israel’s Ninth President Shimon Peres and chairman of the board of the Peres Center for Peace and Innovation, presented the award. He noted that his father’s stroke, which precipitated his passing, occurred exactly two years ago to the day. He reflected on Shimon’s legacy, his close friendship with Ambassador Lauder, and the special meaning of the occasion. “Ambassador Lauder is one of the few Jewish leaders who speak out, who states their mind, who cares, who has actions everywhere, and I’m deeply honored to present him with this award today,” Chemi Peres said. Ambassador Lauder shared memories of his friendship with the late President Peres, including the time he took his two grandsons to meet Peres in Israel, and traveling with Peres to a nanotechnology conference at the University of Pennsylvania and being floored by his mastery of the issue. He also spoke about continuing Peres’s work on the two-state solution. Lauder, who has been President of the World Jewish Congress since 2007, is one of the world’s most influential voices on Jewish issues and a strong advocate of the two-state solution. The Peres Center for Peace and Innovation was founded in 1996 by the Ninth President of Israel and Nobel Laureate Shimon Peres.